McCall is a resort town on the western edge of Valley County. Named after its founder, Tom McCall, it is situated on the southern shore of Payette Lake, near the center of the Payette National Forest. McCall is a year around resort community in Idaho’s west central mountains. It is situated on the southern shore of Payette Lake at 5,021 feet elevation. As of the 2010 Census, the population was 2,991. 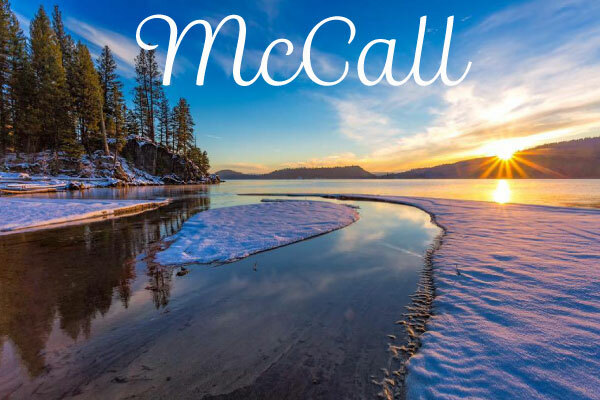 With the highest average snowfall in the state, McCall is known in the winter, for its Winter Carnival, snowmobiling, and alpine, Nordic and backcountry skiing. Summer boasts warm, sunny days and cool nights. Payette Lake in the summer is host to both motorized and non-motorized watercraft, and public and private beaches and docks. In and around McCall are numerous hiking and mountain biking trails, as well as five golf courses in the area. The north fork of the Payette River flows through McCall on its way to becoming a playground for kayakers with world-class whitewater, thrilling by paddlers from around the world. Summer is a busy season in McCall with music, art festivals and relaxing lakeside.